Mac and Cheese is the quintessential comfort food. I love a gourmet version that is made from scratch with gooey cheese sticking to the fork of each bite. I am also not opposed to the box variety; it got me through college and it still gets me through a bad day. 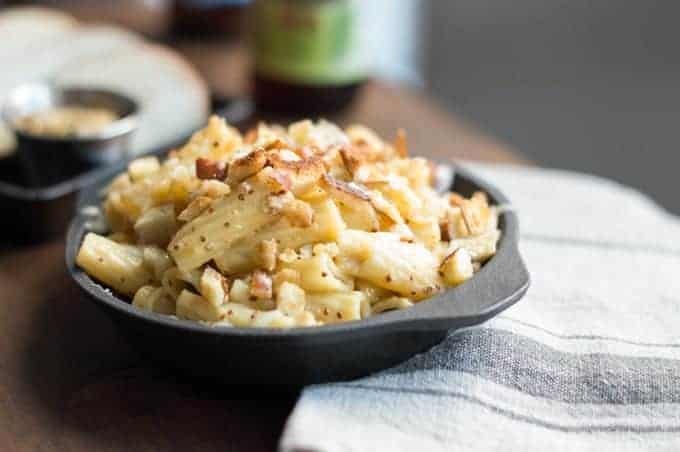 This pub style mac and cheese that Keith created is simply delightful. It is comfort food beyond compare, as it uses some of my favorite vices: beer, cheese, and pretzel bread. It doesn’t get better than this. 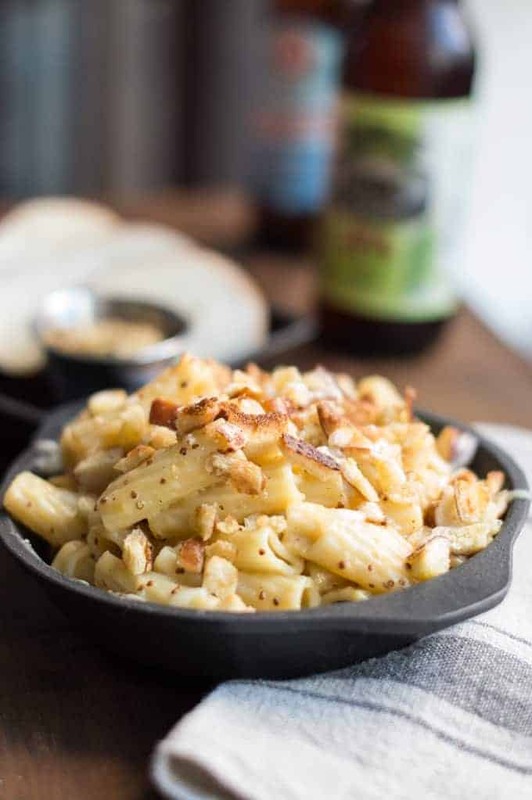 Keith’s Pub Style Mac and Cheese was conceived out of his love for traditional bar appetizers. He makes a simple mac and cheese (which he can do with his eyes closed) for the kids all the time. But for this version, he wanted to add some more developed flavor to appeal to an adult palette. He geniusly blended two cheeses with a bit of IPA and mustard to create the perfect “tang”. 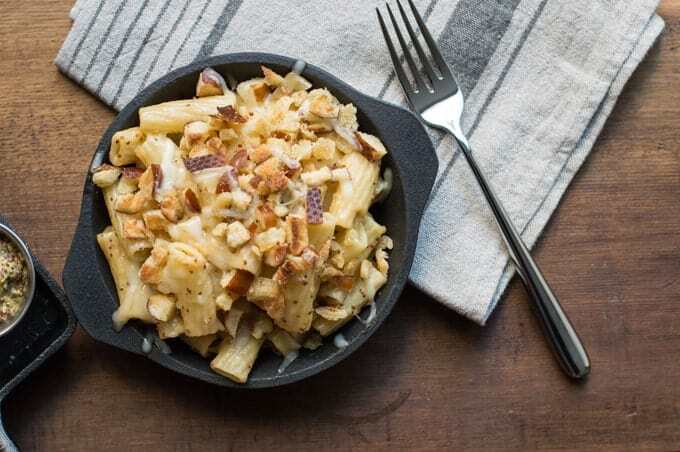 We chose elicoidali pasta for this dish, as this tube-shaped pasta with helix ridges best soaks up the beer cheese flavor to create a perfect, ooey-gooey bite. The “piece de résistance” of this dish are the homemade crunchy pretzel pieces crisped up and placed on top of the mac and cheese. Keith used Bavarian pretzel rolls to create a pretzel “crouton” that takes this dish to the next level. We enjoy this delicious comfort food with a nice KBC IPA. In a sauce pan, melt 2 tbsp butter and mix in 2 tbsp flour and cook for 2 minutes over medium heat. Add milk and cook over medium heat for 5 minutes until slightly thickened, stirring frequently. Add cheese and mustard and reduce heat to low. (if too thick you can add more milk or beer). You want a medium thickness to the sauce. In a separate pan, melt 2 tbsp butter and add chopped pretzels to coat with butter. Combine cheese sauce and pasta and transfer to an oven safe container and bake in a 350 degree oven for 15 minutes. Remove from oven and sprinkle with pretzel pieces and return to oven to bake for 15 more minutes. Love mac and cheese.. especially when it’s as delicious as you make it here. Nice touch adding pretzel pieces too! This looks like heaven in a skillet! Love the pretzel on top! Thank you, the pretzels are what “made” it, it was good but they stepped it up. Well of course you can omit the mustard, we used it because it goes great with cheese, beer and pretzels. As far as the cheese, you can use any, however you should use a sharp cheese, the sharpness helps make it flavorful, if you use a milder cheese, the beer consumes the flavor of the cheese, you need a balance. Thanks so much for the comment, let us know how you like it. Macaroni and cheese is a favorite dinner in our house. This recipes sounds delicious, especially with the Bavarian pretzel topping – can’t wait to try it. Thanks for the kind words, we appreciate it. I make this ALL the time and people love it (even my 3 guy chef friends). Cheers for sharing! Wow! that’s awesome Suzy! We love it too! It is certainly a crowd pleaser. Thanks for the great feedback! !